Discussion in 'Off Topic' started by Stormyqq, Dec 27, 2015. 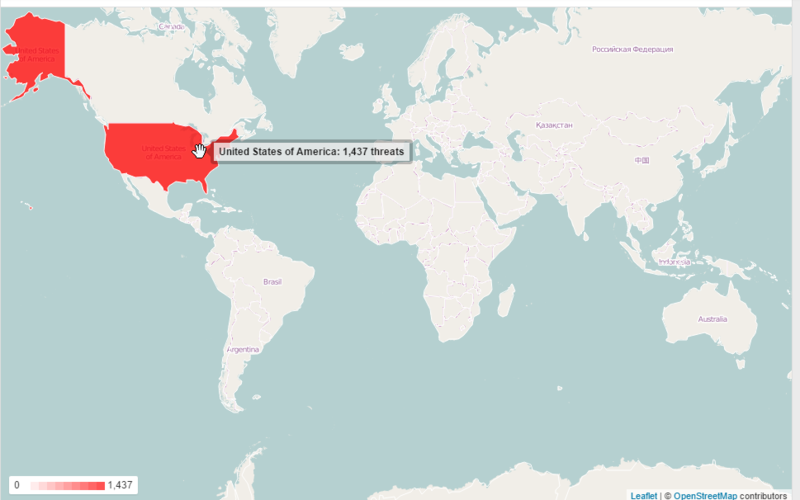 This host blocks a lot of countries and allows people from the US but actually the US is the most dangerous country in the whole world apart from Russia, China. This is my website which hosts in a European host and it constantly gets attacks from the US, but luckily they are blocked. You should note that the country block that was set up is mainly based off of the bad accounts that were previously registered and possibly attacks towards their servers. but most of the attacks come from US and Americans use the proxy and foreign VPNs to do all their criminal works. I think this method is completely unfair for a lot of people who don't intend to do anything offensive. there are a lot of good people out there who just want to host their website nothing more, but this current method blocks them all. there are a lot of criminals in the allowed countries. the admin of the website says if the country takes legal actions against criminals, he will consider for allowing them in, but he opens the door to all the people in the premium section showing his hypocrisy. if he wants to block the criminals and allow legit people in, then he has to try another method not blocking an entire country. as an example Only allow people who have gmail because it's difficult to do anything illegal with gmail as google bans criminals. force people to active in the forum and make at least 5 posts, make a website index in the forum so everyone can see every single website hosted in this host and then allow people to report them and rate them like in WOT ,so community can keep their eye on the websites and report if something bad happened, force people to use their own domain and not accept free domains (so tk,ml,ga, etc..) criminals hesitate to buy domains as it can expose their private information to outside, before registering in the host,force people to describe what they plan to do with the host. there are a lot of methods to implement to keep the bad people out of the site. also like in PayPal, force people use a debit card and charges like $2 from them and then tell them to type the number comes with the bank statement, this verifies the person. after the person is verified refund the money back to the credit card. but most of attacks come from US and Americans use proxy and foreign VPNs to do all their criminal works. if Americans are criminals as you say - why are you using a American host ? if Americans are criminals as you say - why are you using an American host? I don't use an American host, my host is a European one. I didn't say anywhere all Americans are criminals, I said certain Americans use foreign VPNs and Proxies to do their criminal works. you don't hear a lot of scamming, criminals works from the US IPs much because they have money to spend for foreign VPNs unlike Russians, Nigerians who tend to use their home computer to do their criminal activities. I don't use this host, I didn't even register in the host. you are simply an idiot. I will ignore you in next time ,because you waste my time. I came here to post my opinion not to register in this host. Having an opinion is one thing. Please don't force it on people though. There are threats everywhere these days, not just in America or China. It makes no sense to argue about this guys. We are all in the battle to fight spam right. ?? Our country restrictions are decided based on previous statistics of abuse on our hosting service. We obviously understand that by blocking a country, we will also be blocking legitimate users, but unfortunately, this is the only accurate way we can pinpoint abuse and keep our free hosting services reliable. That said, we completely understand how frustrating it can be when a legitimate user is refused a free hosting account, and that's why we have been looking at opening signups up to more countries, which we started several months ago. the admin of the website says if the country takes legal actions against criminals, he will consider for allowing them in, but he opens the door to all the people in the premium section showing his hypocrisy. This isn't the reason the country restrictions don't apply to premium hosting. When comparing abuse between free hosting and paid hosting, the abuse on paid hosting is significantly smaller than on free hosting. It's because free hosting is free -- people can try abuse the service without spending any money -- and so we have to have tighter restrictions on free hosting, and balance those restrictions with the goal of offering excellent free hosting. These tighter restrictions are reflected in both our Terms of Service and our country restrictions. I'm going to keep this thread open for now, since I'm happy to talk about the country restrictions, but please keep it civil, especially when you're talking to other members of the community. I also just wanted to add that some countries we had blocked had abuse rates above 95% (that is, out of every 100 users signing up, 95 or more were engaging in illegal activities on our network). In a great number of abuse cases I've been responsible for handling, we've seen accounts that were signed up for and within 5-10 minutes were found to have illegal material such as DDoS scripts, bots, password crackers, phishing websites, etc. The record I've seen is 23 seconds. If you have an alternative option that would block the bad users and prevent our staff from being swamped by a deluge of abusive accounts that compromise server stability and occupy resources (including disk space) that would be better used by a legitimate user who has read and actually follows the Terms of Service, we are open to discussion, and always have been. Thus far, an alternative has not been found that would work with our current setup. Only those who have hosted a large number of websites would understand the country restrictions like those in place here at x10. You'd have to "forgive" those who keep attacking the country restriction rules because they think that everyone owes them a FREE hosting. I can understand country restrictions but isn't it possible to do other ways of blocking? Countries like Russia, China, etc. have a lot of proxy servers hosted and anyone could just use an IP from there instead of the real one, as was stated above. Things like phone verification, email blocking (only allow Gmail, Outlook, Yahoo and a select few others), other such things. This has been discussed over and over again. Free hosting generates no direct income so the amount of time spent dealing with offending websites, which due to requiring no payment is higher anyway, is wasted.